Are you trying to motivate students to behave better, to work hard, or to accomplish and achieve greatness? ....There are a lot of things a teacher can do to help motivate their students, but the person who controls how much work the kid does is the kid, not the teacher. This article outlines seven potential reasons why kids won't work. Then, possible solutions to the problem are listed as well as a few resources I found helpful and valid. I hope you find something here that will help a student in your classroom! If you see any more good resources, please let me know! They don't understand how or what to do. 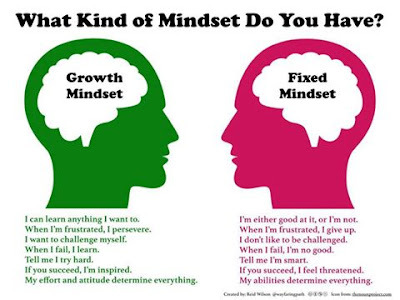 Entitlement mindset: The student has been previously (erroneously) taught that the artwork s/he does is always perfect, that there can be no room for improvement because art represents who they are. The student has "learned helplessness" and wants constant feedback from the teacher instead of buckling down and getting to work. 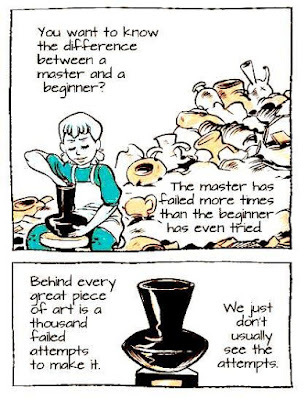 S/he believes Art is not important and thus hard work is unnecessary. The student wasn't paying attention during the demonstration/lesson. The student has friends in the class and is more motivated to play than work. The student doesn't feel like working/doesn't want to work. S/he doesn't have to pass the class to advance a grade. Defiant attitude - the student doesn't want to submit to the teacher because either s/he has an inflated ego or the teacher has not yet won the respect of the student. The student is seeking attention by talking too much, not working, or wanting excessive help. The student knows the teacher will not hold him/her accountable for working hard. There is a dislike for the teacher, or a belief that the teacher doesn't like the student. They don't like the project media, style, etc. The project does not personally relate to them. The student is afraid of failure, of looking stupid and incompetent. The student has had a pattern of failure at school, and has given up. S/he believes the work is too difficult to attempt. The student is bored because the work is too easy. The student is unengaged because s/he is tired of working on the project. The student is stressed, suffers from lack of sleep, sick, or hungry. The teacher gives vague instructions, is unenthusiastic, negative, talks too much or too fast, expects students to perform at a too high (or too low) level than they are capable, or does not take into consideration the interests of the student. Also, if the teacher inconsistently hold students accountable (ignores misbehavior), this can create a chaotic environment in which the temptation to be lazy flourishes. 8th graders motivated with real easels. They worked like artists on this! All in all, I have found that secondary teachers' number one issue is dealing with unmotivated students. Kids come to us believing they don't have to work hard because "It's just art, right?" In middle school, they know they don't have to pass my class to go on to the next grade, and they usually start out the year much more motivated to talk and play than to do their work. I also have to be very creative at finding ways to encourage my students to produce QUALITY work because they do not have to pass my class to advance a grade. I tell them that they will not like everything they create, and that some people who love to draw don’t like the unpredictable nature of paint/clay: some people who dislike drawing are gifted designers, etc. I throw out a lot of different kinds of projects so they can find something they can be successful with! Also, I try to provide as many choices as possible and to create an environment where it is okay to fail. ("The road to success is paved with failure.") The bottom line, though, is that 99% of success is hard work. 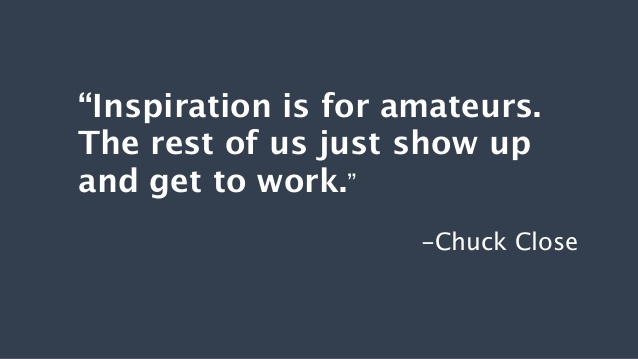 Chuck Close once said, "Inspiration is for amateurs. The rest of us just show up and work. Every idea I ever had came out of the work." “Many popular teachers are strict; yet, at the same time, they treat students in a friendly and respectful manner, they make their classes as interesting as possible, and they try to make every student feel a part of the class. Such teachers are both liked and respected, and they wield a great deal of power with students.” Dr. Irvin King, "One Man's Perspective of Discipline in the Schools"
"Seek first to understand, then to be understood." Steven Covey ... Have you surveyed your students to find out about their likes/dislikes? Do you know what kinds of projects they enjoy and which they hate? 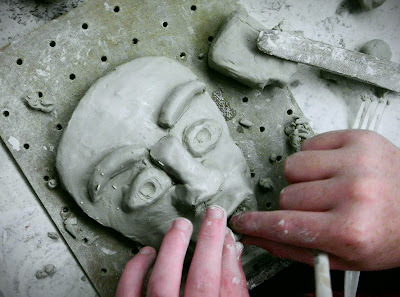 .....Try something messy like paper mache or clay instead of drawing. There are actually very few kids who are highly motivated to draw really nice, sophisticated drawings. However, almost all students are motivated to get their hands dirty and build! 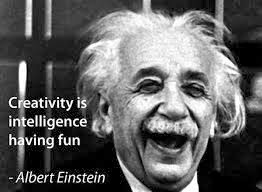 Most students we teach will not become professional artists, and it is important to foster an appreciation for art, keeping it fun. Make your instructions clear and concise to avoid student confusion...do they understand the "big idea" behind what they are doing? How does it relate to their lives? What's the point of doing it? How exactly do they accomplish the objectives of the project? Detailed rubrics really help make the "invisible visible" for my students. If it is clearly in writing, they are much more likely to try to meet the criteria for the project. This quote from Melissa Purtee sums up the TAB Choice philosophy quite well: "'I am learning because I want to do it,' vs. 'I'm learning because you want me to do it.'" Teach them how to think; teach them about their own unlimited capabilities; teach them about the universal power of visual art. Allow yourself to make mistakes in front of them so they can see how you handle it. Make your thought processes visible to the kids, be an example. Also, teach your students about the Growth vs. Fixed Mindset. 4. DISCIPLINE; if students won't work, and you know there isn't another issue (health, lack of understanding, etc. ), they just might need a little motivation in the form of a negative consequence. Click on this link to read more about discipline. ... This link takes you to the page, "Discipline Assignments For Art." Providing authentic praise and encouragement, and even rewards can help tremendously. 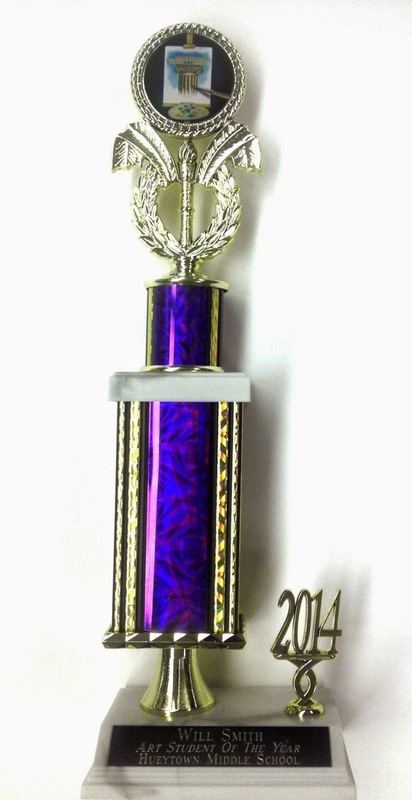 Use rewards and incentives carefully, though; overuse can backfire, leading to a lack of motivation. These also lose effectiveness with older students. The more positive remarks you make, the more you look for ways to authentically praise your students' efforts, the more they will be encouraged to do well. Jessica Balsley (theartofed.com) has a list of 50 Positive Ways to Reward students in the art classroom. "Lack of confidence or an impossible ambition may both cause failure but if we work realistically, accepting ourselves as we are, confidence will come or vaulting ambition learn a moderation that leads to success. As the power of achievement grows, we shall find that we have it in us to do work stamped with our own distinctive character, because character develops inevitably with the things we do, and that we shall be making a contribution in itself unique to our surroundings. The only fatal thing is to give up trying, to allow that sense of innate ability to become submerged, turning to a feeling of frustration and finally indifference. By so doing we shall cheat ourselves of some of the best things in life. Once started on the good road to craftsmanship there is no knowing where a man will stop. One thing has an odd way of leading to another, interests and accomplishments grow and thrive by the way. To the end of our days we shall probably feel conscious of the things we might have done and did not, but in so far as we were willing to pay the price of achievement we shall have something to show for having lived." In general, one of my biggest concerns is that teachers should be firm but fair, but in so doing, establish relationships with and get to know their students - make a point to work one on one with each person, give praise, encourage steady work, assist where help is needed. I have measures in place to recognize and reward each student, for example, I have a birthday calendar and the student gets to wear the birthday hat on his or her big day; I have "art bucks" which are given to students who do good deeds, help me with errands or chores, help others, etc. - I draw art bucks each Friday for small art-related prizes I find at the thrift stores. The kids will respect you if you set guidelines, enforce them and hold students to those standards, while fostering an environment of learning! Make lessons fun and keep your sense of humor. Finally, make sure you contact parents when necessary, but not necessarily just for negative issues, such as undesirable behavior. Send a note home praising a student who has done an exceptional job on a project or in the classroom. If you do have to contact a parent or guardian, make sure you say something positive about the child in so doing. Most parents WANT to hear from the teacher, whether for positive or negative concerns. an experienced high school teacher writes: "My number one management issue is with kids' homework assignments and them turning them in on time. (middle and high school) In itself, this really is not an issue of classroom management per se, however, it becomes one when I have to constantly chase down homework, talking to kids ( usually it's the same 3 or 4), reminding them day after day to bring it in: in other words I am losing precious instruction time. I have looked at this matter for many years and tried many things and even though it's gotten better it's still a problem. Our school has a "no zero" policy and teachers could get in trouble for not going the extra 1000 miles (and being able to account for that effort) to make sure each kid is turning in homework in order to get some kind of grade even if it is just a few points.I don't realistically think there is an answer out there because this problem just comes with teaching kids. Lazy kids will continue to show up in art classes as in any other classes. It's nice to be able to speak this aloud amongst like-minded art teachers. Maybe someone will have a new idea I have not thought of yet! She is right. There will always be lazy kids so you will never get 100% participation. I always gave points but that didn't matter to some. I checked their homework during class and would try to brag and show good pieces. That would spur some to try to do better to get recognized. At random times I required them to use one of their homework assignments as their class project. They never knew when I would do this so most of them tried hard to have good homework ideas. Hope this helps. Find out what the other teachers do in this situation. The school and teachers should work together so everyone is doing the same. Probably those 3-4 are not handing in homework in their other classes as well. In some situations home-life might play a part in homework not being done. Find out if there is a time during the day, study hall etc. when those students can come sit in your room to complete homework. Making it an inconvenience for them not you may cause a change in attitude toward homework. Then again, there are those few who will not do homework for you or anyone else a mindset that “it is not important." Something that you might find interesting are some extreme measures two rather famous educators went to in order to motivate their students to do their work – Ron Clark, author of The Essential 55, and Ben Chavis, author of Crazy Like a Fox. Both Ron Clark and Ben Chavis would visit students in their homes as well as use wild incentives. Ben Chavez would use monetary prizes and resorted to public embarrassment, too. He said he would rather embarrass a student in school than have the student embarrass his/her family later by getting arrested or dropping out of school. (Mr. Chavis was hired to turn around a failing school (close to 100% poverty) in Oakland, CA., and within 4 or 5 years had made the school one of the top 5 performing schools in the state.) Ron Clark took his students on extravagant field trips, had pizza parties galore, and used any and all means to get them excited about learning and motivated to work hard. I’m not saying you should try anything like that (especially the embarrassment bit), it’s just something interesting to think about. This is my 12th year of teaching art. I taught middle school for 6 years and I am now in my 6th year at the high school. I will answer as a high school teacher since this is where I am currently placed. My goals for my students as a high school teacher vary. First of all I must understand why a student is taking Art. 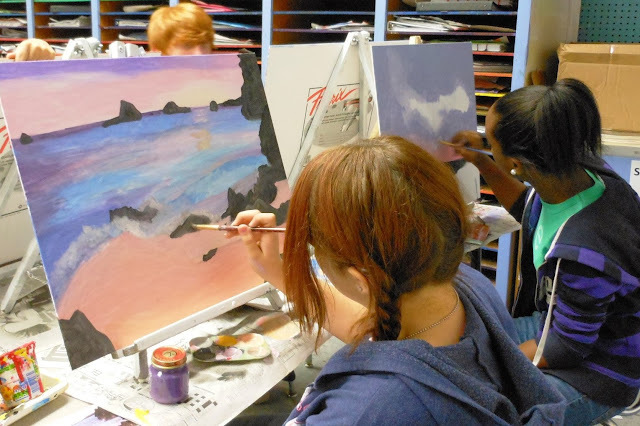 · Art 1: Some students simply need an art credit to graduate, so we focus on completing basic assignments and understanding content. For others in Art 1, Art may be one of the classes that they adore. Understanding that there are some students that will never take art again helps me to keep perspective. Now don’t get me wrong, I never write off a student as a “one-timer”. I strongly believe that any student that walks through my door can achieve and create art they never thought possible. We focus on Drawing and Design with small forays into Sculpture. This is mostly due to class size(usually around 40) and lack of fee money since the class is required for most high school students. Most students are on task and work because of the credit needed and the simple fact that they’d rather draw for a grade than be in another academic class. Most high school kids are reasonably calm. They are social, but I don’t run a silent classroom. · Art 2: Most choose to take Art 2. My Art 2 is an exploration of visual art. Drawing, Painting, Sculpting, Printmaking and Mixed Media. We switch gears so often, they don’t have a chance to get bored. · Art 3-4: They all really want to be in art. By now they have started to develop a style and know their strengths. They still explore new ways of making art, but also have a chance to create a body of work focused on their strengths. · AP Art: We only have 7 this year and these kids are amazing. Keeping them on a strict time table is the biggest challenge. 24 amazing pieces in less than one school year can be rough, but can be done. Ultimately it boils down to know your kids and why they are in Art. We teachers know they content we need to cover, but understanding what your students are ready to absorb at that time is the trick. I am constantly taking inventory of what is sticking. You have to listen to them as well. It’s not always the words they say, but their behaviors. Are they on board with the project? What are their personal barriers to entry? Is the project to difficult or too easy? I give students' ownership in their own production by giving assignments that they can choose media and variations on the assignment. I also play different types of music to either calm, stimulate, or simply enjoy. We sometimes do a little yoga before we begin for the day and I try to get to know my students personally and let them know that I care. It really works! It has been my experience that many of my students think they don't need to work hard in art due to the fact they don't have to pass the class to move on to the next grade. I teach middle school, so it takes some time to win them over to "my side!" I try to talk to them about how success in life is "99% perspiration and 1% inspiration," We talk about how important art is in everyday life and how they need problem-solving and creativity skills in their future jobs. I praise the ones who are working hard and taking the time to make their projects neat. I really make it a point to acknowledge it when kids do something "extra," too, like a really good idea on the art piece, or picking up someone else's trash, etc. I have a place on the rubric for "Participation/Effort," and I can dock points if they make it a habit to not do seat work or clean-up. Basically, my expectations are that the kids WILL work hard. The experts say they will live up to your expectations! Sometimes, the kids are being disrespectful and taking advantage of my good nature, and they try to get away with playing/talking/goofing off/sometimes throwing paper at each other, etc. At that point, I figure they need disciplinary action and I will write them up. That kind of misbehavior can usually be spotted even before the paper wars start, and I will give a verbal warning to get busy, then I will have them sign the blue form and write the discipline assignment, call parents, etc. My personality is not big like some teachers; I am pretty reserved and quiet (not that I don't get loud sometimes, I do!) So I have had to learn other ways to motivate the kids besides just having a magnetic personality. I have survived 10 years, thank God! The biggest challenge as a middle school art teacher is that most middle school age kids want to be the same. They want to fit in and not stand out. 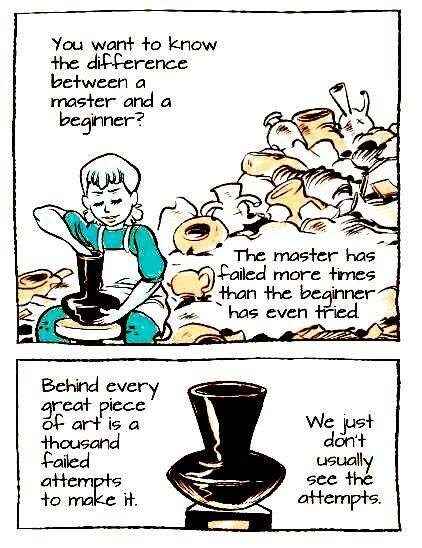 This translates into their being afraid to take risks in their art work. In general there is a fear of making a mistake so they are overly cautious. I agree wholeheartedly! My students, both artistic and non-artistic, are afraid of making mistakes. I try and try to talk to them about the learning process, and recently I heard a quote (probably from one of the TED talks) that if one is afraid to take a risk, one will never be original/come up with a new idea. I think this year I have trained most of my students that it is okay not to love every project they create, and it is okay to mess up sometimes. Like you, though, I really wish they weren’t so freaked out by being “different”. Just out of curiosity, what community do you serve? Is it mostly blue-collar, like mine, or is it more affluent? I recently talked to a middle school art teacher who serves a VERY affluent community who said almost exactly the same thing you did. I think that the biggest concern as an art teacher is student motivation. In saying that, there is a lot of thought and time put into planning lessons that will be seen meaningful to the students, but at the same time will build a strong foundation for them in art production, art history, and art aesthetics. Another integral part of successfully motivating students is for me as a teacher to establish relationships with students and to allow them to be a support system to each other. Breaking up the classroom time to provide opportunities for individual and group critiques, allowing students to participate in community service projects, and school improvement based art projects allow the students to see purpose in an art program, because all of those activities build relationships and character in and outside of the classroom.